Daily Dazzle E - FREE LESSON (7th grade) is a STUDENT DIRECTED, DAILY BELL RINGER PRODUCT, with an optional free Common Core alignment. THE TOOL BOX, WHICH IS A ONE TIME PURCHASE FOR ALL OF THE DAILY DAZZLES A - E, MUST BE PURCHASED SEPARATELY for $8.00. It provides all of the rules of grammar, punctuation, parts of speech, capitalization and more for all of the lessons and is directly coordinated to the questions on the worksheet by page number. THE DAILY DAZZLE PRODUCTS ARE MOST EFFECTIVE WHEN USED WITH THE TOOL BOX. Follow the link and take a look. 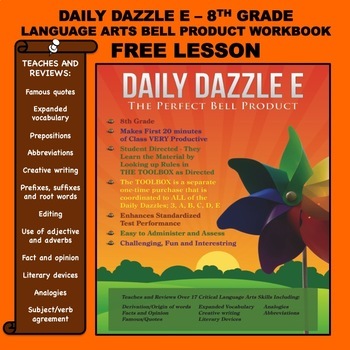 DAILY DAZZLE enhances performance on Standardized Tests, is easy to administer and assess, and students find it challenging and fun. Students work on their weekly Daily Dazzle lesson for the first 10 to 20 minutes of class each day, and then either self-grade or class grade the lesson on Friday. The teacher can put the weekly lesson on an overhead, smart board, or give each student a copy of the lesson. Included in the lesson: A description on how to use the lesson, the student worksheets, the lesson, the answer key and an example of The Tool Box. Please note that the free lesson, Week #1, is included in the first bundle of lessons, but there is no charge for it. Log in to your My Purchases page, and beside each purchase you'll see a Provide Feedback button. Click on it, and you will go to a quick rating and leave a comment on the product page. Now, here's the good part! TPT gives you feedback credits each time you leave a comment, that you can use to lower the cost of your future purchases. Your feedback saves you money and helps me know if what I am producing is meeting your teaching needs.